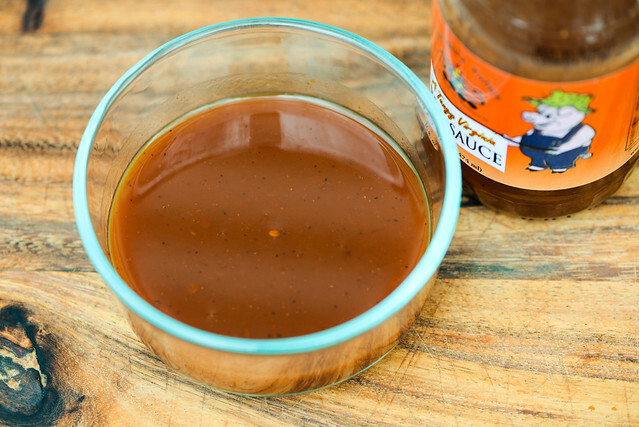 A tangy vinegar sauce with just enough ketchup, sugar, and pepper to give it a slightly sweet and spicy, crowd-pleasing flavor. Shaffer's BBQ has a long family history in smoked meats dating back to 1956 when John D—current owner Matt Shaffer's grandfather—started selling barbecue chicken at festivals around the Shenandoah Valley. Next, Matt's father, George, continue that tradition while building upon it with the addition of a catering business. Now it's Matt's turn at the helm with his barbecue food truck that's based out of Winchester, VA. On top of slinging smoked chicken, beef, and pork, Matt has also created a line of two sauces and rub that he sells online. An upfront tartness greets you on first whiff of this sauce. It's not as harsh as straight vinegar though thanks to a sweetness and tomato ketchup aroma that puts the tanginess in check. Beyond those three primary aromas, there's background notes of onion and garlic and hints of a peppery heat, although those struggle to come out from behind the sweet and tangy. The story the aroma told is furthered by the thickness, which is best described as vinegar thickened slightly by was of ketchup. This creates a medium-thin consistancy that lets the sauce flow quickly and freely from a suspended spoon. Almost all the sauce releases in a couple seconds, and after a few final drips, almost no sauce is left clinging to the silverware. The ketchup-vinegar combo also combines to give the sauce a bright rusty orange hue and semi-transparent opacity, letting you easily see the lots of red and black spice specs peppered throughout. Despite the heavily tart aroma, this sauce has a pretty sweet start. At first it's sugary with a bright tomato ketchup flavor. Then, within a matter of seconds, the vinegar comes in and ramps up quickly to create a extremely tangy and tart flavor. Although that's certainly the aspect that dominates the sauce from this point onward, the ketchup and sugar continue to play a role while a wave of spices also add depth—first by way of onion and garlic and then with a mellow peppery heat that grows to medium burn by the time all is said and done. The vinegar never lets down though, which leaves a final tart and spicy aftertaste. Although the sauces' consistancy is just a notch above vinegar, it still managed to coat the chicken in a thin, even layer that gained a bit of heft and decent color after multiple brushings over indirect heat. When moved to direct heat, the sauce picked up a little caramelization where the chicken touched the grates. The flavor remained bright and tangy, but with more emphasis on the sugar, which also let more of ketchup flavor come through as well. The heat was minimized after being cooked, leaving just a mild peppery kick. Since the sauce coating was light, the flavor on a whole wasn't very super strong, but it did leave the leg with an uncomplicated and pleasing barbecue profile. 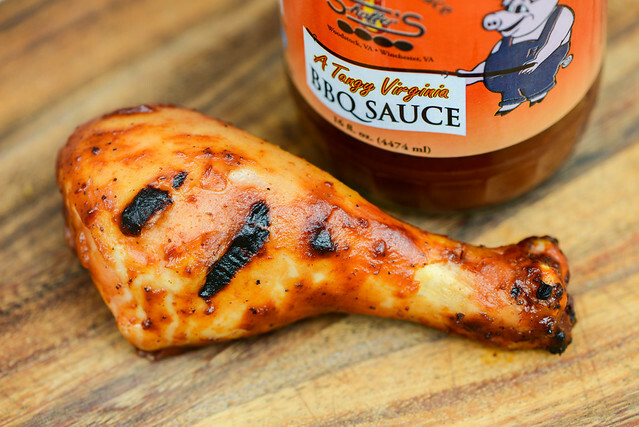 I always feel a little bad putting a vinegar-based sauce such as Shaffer's Tangy Virginia through the full standard test since they're usually not made for grilling. Doing so left me pleasantly surprised in this instance though because the sauce actually held its own on the grill, even if the final flavor was a tad underwhelming. 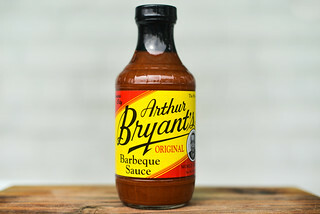 Of course, this sauce is really made for using out of the jar on a pile pulled pork or chicken, and I think it would preform that task exceedingly well. 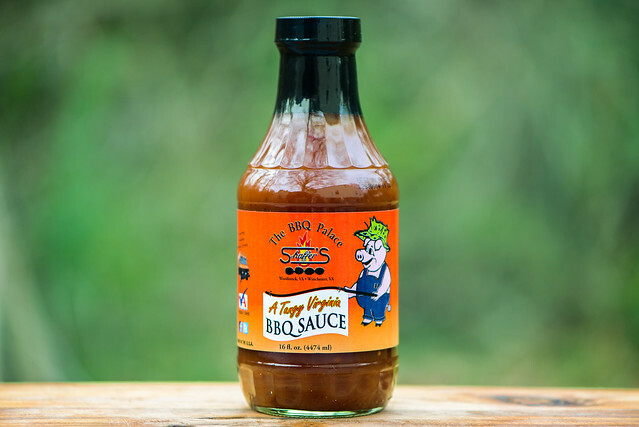 Unlike a traditional Eastern North Carolina sauce, this "Tangy Virginia" introduces more sugar and ketchup, giving it what is probably a more universally crowd pleasing flavor profile. 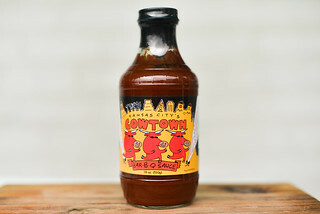 I can imagine a backyard of happy eaters if they had this sauce to slather on their piles of smoked pork shoulder. Have your own pile pork waiting for some of this sauce? You're in luck, a bottle can be coming your way soon thanks to Matt Shaffer who provided an extra for me to giveaway. 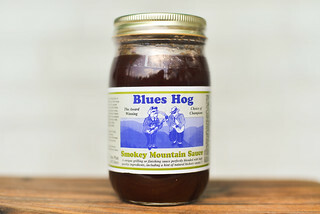 If you'd like to be entered to win the sauce, all you have to do is comment on this post with what the most memorable bite of smoked pork you've ever had is. Deadline for entries is 11:59pm on Tuesday August 16, 2016. Read the official rules for more details. One entry only per individual. Good luck! Sugarfire Smokehouse in St Louis has some of the best BBQ on Earth! This sauce would pair heavenly with their pulled pork. Not to pat my own back, but here goes. It was 3 years ago when I was still trying various rubs and sauces on my own cooks. I decided to use Chris Lilly's injection, rub and sauce on two 10 lbs butts for a party of 40 people at my house. The end product transcended anything I had before. Almost everyone commented it was thee best they had as they polished off all 20 lbs of BBQ. I've been doing the Lilly recipes ever since. Would love to try this sauce with it. It was definitely the first bite of rib I had when I was a very young kid. I can't remember the name of the place, but the ribs were incredible and slathered with a sweet sauce...changed my life forever. I've been a BBQ junkie ever since. roasted my first whole pig last summer. changed how i think about bbq. My husband grills the most memorable pork ribs that I know of! He's got it down to a science! Last week a co-worker brought in smoked pork shoulder for all. Fantastic.